Town boss Nathan Jones doesn’t believe his side are guilty of lacking character in their quest for promotion this season. The Hatters have seen their advantage at the top whittled away in recent weeks, leapfrogged by Accrington Stanley, and could go into their clash against Barnet this evening sitting third in the table if Wycombe beat Forest Green beforehand. 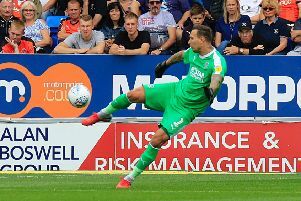 Some supporters have started to worry that Luton will blow their chances of promotion this term, but Jones said: “There’s been a momentum shift if you like in terms of certain stuff, now there’s been a lot of factors in that. “We’ve been fluent up until the end of January, and even in most of February, we’ve been in scintillating form, wonderful form. “Even the games we’ve drawn in that time, it took some side to stop us or circumstances to stop us. “Now we’ve had a little bit of a blip in terms of results. Performances levels have been there, we’ve still done exactly the same stuff, things have gone against us, but we’ve just got to come through it. “That’s what character is. We’ve shown we’ve got character as we’ve gone behind in a couple of games and we’ve come back. “We’ve shown we’ve got character when we’ve gone down to 10 men at times, we’ve won the game, saw the game out, and we’ve shown a lot of character. Despite going into the match on the back of five games without a win, with four draws in that time, Jones knew it wasn't going to be plain sailing for the entire campaign. He continued: “I think everyone has a run like this through the season. “Some have it at different times, some have it at the beginning, we’ve been fairly consistent, we’ve been nearly four months at the top of the league, so we’ve been there to be shot at if you like and it’s taken a lot. “Now we’ve had a slight dip, but I wouldn’t say performance levels have dipped. Things happen over a season, but you’ve got to really remain focussed, come through this and finish strongly, that’s what we’re aiming to do. One thing Jones has urged his side to cut out though is their poor starts which has seen Hatters fall behind inside the opening five minutes against both Newport and Coventry. He added: “You can’t fathom for that. We look to have a fast start every time we play, it's just been individual things. "We get beaten out wide and things happen, and it’s been disappointing as our defensive record has been very, very good. “Little things have happened and it's meant we’ve had to chase games and show a lot of desire and character to get back into a game, which we have. "Then when we score two goals or one goal, it’s meant to draw a game and not win it, which we have to rectify. “There’s not a hell of a lot wrong, it’s about us doing the right things. "We’ve had a few things go against us, which we’ve now put to bed and we’re really looking forward to this run-in.